Bed Head = Head Board A Bed head is the impression left on your head after lying on your back too long. Main Meal = Entrée If you’re not hungry, don’t ask for an Entrée! Boot = Trunk “Chucking it in the boot” is not a familiar term here. Cheque = Check Used here for everything. The bank statement includes a page containing a copy every check presented during the month. In Australia, a telephone or utility bill lists about 6 to 8 different ways to pay – Cheque, Bpay, Credit Card, Eftpos, direct debit, Australia Post, etc. Here they all want you to pay by check. North country campers may be surprised to be bitten by tiny insects that can hardly be seen. So minute are these midges, called no-see-ums, that they can easily go through window screens and the mesh of some tents. Also called punkies and sand flies, these 1/10-inch-long critters are the smallest of the northland biters. They belong to the family Ceratopogonidae, which has about 460 North American species. Most feed on nectar. Several midge species will attack other insects. If a mosquito is full of blood, a no-see-um may bite her and steal the blood. When and how does it bite? A few species of midges go for human blood. The females need protein-rich blood so their eggs can develop. Like mosquitoes, midges feed at dusk. They puncture skin with a pair of mandibles, which look like scissors blades. Life cycle. Midge eggs are laid in ponds. The larvae look like thin worms. The pupa floats but does not swim. 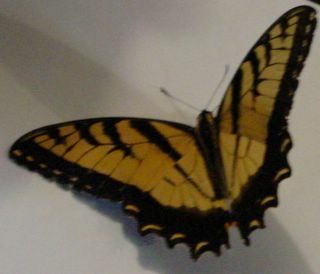 Adults usually emerge in summer and feed in June and July. Adults do not fly far from their breeding grounds. Some people say you can escape from no-see-ums by simply moving a few feet away. Good news. Thanks to biting midges we have chocolate. One species pollinates cacao trees, the source of chocolate, in lowland tropical forests. This bee does not sting but makes quite a loud buzzing sound as it flies around. It tends to speed along, then stop and hover just in front of you (as if it was telling you some good news) and then flies on. They look exactly like a horrible nasty biting wasp. These are like mini crayfish that live in the creeks and streams. Eric and James had a great time exploring with Jonathan Floyd in the creek at the Floyd’s place. 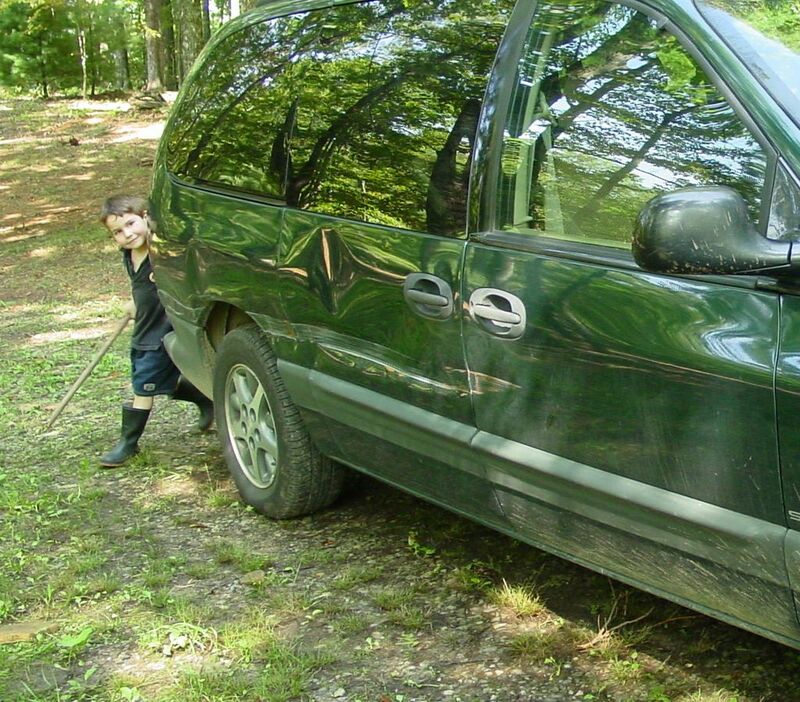 They found Crawdads, blue tailed lizards, salamanders, skinks and lots of nifty things. We have seen some really large and beautiful butterflies and moths including the white Webworm Moth, Tiger and Black Swallowtails and others. It’s a shame to wreck a good story, but we spoke with the Greeter later and she said that the Policeman regularly pops in and says Hello, and they weren’t talking about us at all. Phew! See the ding on the side door? It wasn't me. I passed the test and received my license - $15 for 4 years. The driver stepped out and the policeman began to hit him over the head with his clipboard. “Stop, Stop!” cried the driver. “Do you want me to stop or slow down?” asked the policeman. We finally built the playground. Can you imagine the torture of being a boy that loves climbing trees, surrounded by a forest, yet no tree has branches that you can reach? James decided that we would have to go home as there are no trees in America that he could climb. So, we had to have something outside on which they could all play. We didn’t want a small thing that would not survive active play. The local hardware store (Home Depot – similar to Hardware House) had a home playground kit. All the screws and bits were supplied - just add lumber. Easy. First problem: How do we get it home? The car we had wouldn’t fit the lumber, and I did not yet have a US driver’s license or insurance in my name. Luckily, the Ogburns were able to assist and we used Ward’s dump truck to transport the wood. Can you guess who was the builder and who was the assistant? Next Problem: It’s a lot of wood, and it all needs to be cut. And put together. And it’s all quite heavy. Step in another local family – The Floyds. David Floyd is a builder/carpenter and teaches at the local College (cross between TAFE and University). He likes this type of stuff, so I passed wood, held up bits, held screws and was general builder’s assistant. 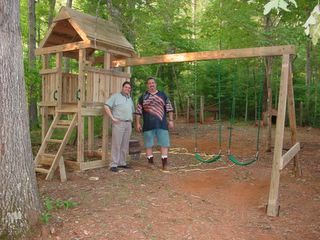 Over two Saturdays we constructed the playground. Lana and Vicky Floyd fed the troops and the children kept asking, “Can we play on it yet?” Now that it’s built, James reckons we can stay a bit longer. 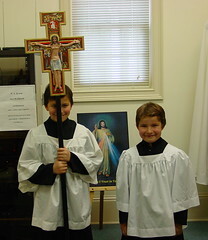 Eric and James assist at Mass.